A week after the event and the buzz from FantasyCon still hasn’t worn off. Scarborough turned out to be a fab venue, with an energising combination of faded Victorian grandeur and sea air. I’m determined to go back and explore the area properly when there aren’t as many distractions. Alex Davis and his team of volunteers set up a wide-ranging programme of events, and huge thanks are due to them for organising a great weekend. It was refreshing to have plenty of space in the various function rooms so there were no disappointments turning up to find the room already packed out. 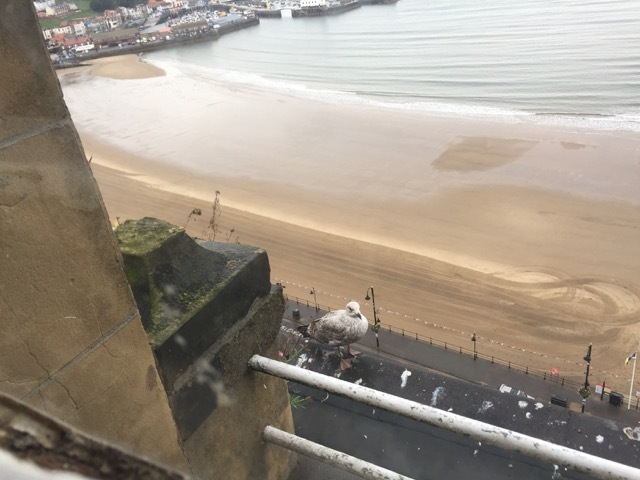 The seagulls provided a startlingly effective morning alarm call service, necessary after sitting up late into the night talking about diverse matters, such as Ballard, and trees, and Tolkien. Good company, good times. On the Saturday I took part in a well-attended panel which was ably chaired by Terry Jackman, along with Stephen Aryan, Jen Williams, Ian Whates, and Steve McHugh. We discussed whether we should be killing off our main characters and seemed to reach a consensus, that yes, we should. Except when the character in question is Mog, the Forgetful Cat. We also established it was extremely difficult to talk about death of main characters without spoilers. It was lovely to catch up with the Angry Robot team again. Marc, Penny, Nick and Jared took excellent care of us over the weekend. I was on the train home when the news broke that Angry Robot Books had won the BFS Award for Best Independent Publisher. I’ve learned it’s remarkably difficult not to jump up and down and shriek with glee in a situation like that. Many thanks to everyone who helped make it such an excellent weekend! That was last weekend. This weekend the new Open University MA in Creative Writing begins. This promises to be an adventure of an entirely different kind.